At the core of Saturn's success, the four-door, five-passenger sedans represent the automaker's overall character outstanding value and market segment-leading levels of quality and customer satisfaction. Built on a 102-inch wheel base space frame, Saturn sedans provide a fun-to-drive character with comfort levels typical of larger cars. Saturn SL and SL1 deliver maximum sedan fuel economy as the result of an efficient 1.9-liter four-cylinder engine utilizing throttle body fuel injection and single-overhead-cam (SOHC) designs. Transmission offerings include a smoother wide-ratio five-speed manual or computer-controlled four-speed automatic (the latter not available on the SL). Distinctive black front and rear fascias, P175/70R series tires mounted on 14-inch wheels, and specific interior trim are quick identifiers of the SL and SL1 sedans. Body-colored fascias, P19S/60R series tires on 15-inch steel wheels, and numerous other 'high-line' standard features lend a touring car flavor to the SL2 sedan. Its well appointed interior offers driver-side seat cushion height and seat back lumbar adjusters, with leather trim as optional. The SL's touring car character is further enhanced by its front-wheel-drive power module (engine and transmission). In this instance, a 2-liter, multi-port fuel injected, dual overhead-cam (DOHC) four-cylinder provides spirited sedan performance. The engine can be mated to either a close-ratio five-speed manual or four-speed automatic ransmission. Often referred to as "sedans with a back pack," the SW1 and SW2 wagons have proven to be popular models for those buyers who desire maximum Saturn roominess and versatility, yet insist on expressive style, performance and comfort. Similarities between comparable wagon and sedan models may come as a surprise to some people. For example, both share the same basic space frame construction, with modifications required to accommodate for the wagon's larger cargo area. All suspension component power modules, and a high level of standard features are common between the sedan and wagon. In fact all sedan options except for the sunroof and rear deck lid spoiler are available on the wagon as well. There are important differences, however. The exterior roof and tailgate of the Wagon are formed of a sheet molded compound (SMC) material, leaving the hood as the only exterior panel made from steel. Comparing an SW1 and SW2, both equipped with manual transmission and air conditioning, the base curb weight of the wagon is a mere 42 pounds above the that of the sedan. The top-hinged tailgate has a standard washer/wiper system. When opened, the gate allows access to 23.8 cubic feet of volume with the split rear seats up of a maximum 56.3 cubic feet. Saturn's expressive styling and fun-to-drive image leaders are the SC1 and SC2. With a slightly shorter 100 inch wheel base, these sporty coupe entries have a precise driving character all their own. Among the features that distinguish the coupes from one another are power train combinations in character with their themes -- there's SOHC economy for the entry-level SC1 and DOHC performance for the up level SC2. Visually, the SC1 is highlighted by an exposed head lamp treatment and unique fenders up front; the deck lid has a full-width painted panel in the rear. In contrast, the SC1's design has hidden head lamps and deck lid appliqué carrying the tail lamp theme. Inside, the SC1 is trimmed in custom cloth and vinyl; the SC2 offers upgraded cloth seating as standard, with leather trim optional. Driver and front passenger seat backs have standard recliners and adjustable headrests, as do all Saturn models. Among the many standard convenience features found on the coupes, sedans and wagons be 60/40 split folding rear seat backs. Like their sedan and wagon siblings, the coupes can easily be matched to the needs of the buyer by choosing from a selection of popular factory or retailer-installed options. Although each model year brings product changes, some are subtle while others are more obvious. Yet all have one thing in common each is made to make Saturn more desirable to the customer. That's what "balanced excellence" is all about. Here's the new features that will add to Saturn ownership experience in 1994. A new Medium Blue Green is added to the color palette, replacing the previous Blue Green. Plum, introduced in 1993, now has extended availability to all coupes, wagons and sedan (except the SL). Blue-Black replaces Black; Silver and two-tone combinations have been discontinued. The SL2 comes with a new 15-inch steel wheel / tri-spoke wheel combination as standard; a 15-inch "teardrop" wheel is optional. In addition, the P195/60R15-87H GTA performance tire features a revised construction and compound, providing the SC2 with impressive ride quality and directional stability on grooved pavement. An all-new 15-inch "sawtooth" polished alloy wheel is optional for the SL2, SW2 and SC1, replacing the "gear tooth" design. Windshield wiper systems now utilize an eight-point blade attachment that improves contact over the previous six-point design. An interim '93 change included raising the height of the optional SL2/SC2 rear spoiler to mm (an increase of mm) and reducing the number of stanchions from seven to four. Spoiler will be a new option for the SC1 later in the '94 model year. As a result of its popularity in the up level sedan, and based on customer input, tan leather trim is offered for the first time on the '94 SW1 wagon. Color coordination of trim pieces has been revised to improve the harmony of color values such as seat belts, seal belt latches, seat adjusters in vehicles with tan cloth or tan leather interiors. This change also includes use of a graphite instrument panel and center console, replacing the previous dark biscuit color. In addition, the color value of the blue dash for the SL1, SL2 and SW2 has been lightened for a more luxurious appearance. Introduced during mid-1993, all SW1 and SW2 wagons in 1994 are equipped with a remote electric tailgate release for improved convenience. The release is located adjacent to the fuel filler door release, on the floor and to the left side of the driver's seat. A coaxial front/extended range rear speaker package is new to the option list of all models for 1994, allowing for enhanced listening enjoyment. For additional peace of mind, Saturn has added an extra function to the power door lock option for 1994. With the key in the driver's door lock one turn unlocks only that door; a second turn unlocks all doors. Locking procedures from the outside or from inside remain unchanged. All 1994 Saturns use the new CFC-free R-134a refrigerant for all models equipped with air conditioning. This alternate refrigerant system offers cooling performance equal to the previous R12 system. Specific changes for the new system include a smaller displacement compressor for reduced parasitic load on the engine. A new lubricating oil has been developed for the system, and the desiccant in the receiver dehydrator has been revised for compatibility with the R-134a refrigerant. A high efficiency condenser, full fan shroud with repositioned fan, internal expansion valve, and system-related hoses and lines have all been revised or re calibrated for improved A/C operation. Among the mainstream 1994 design changes contributing to reduced noise and vibration are an improved dash mat with fewer front-of-dash gauges, as well as refinements to the torque axis mount and mid-rail mounted transmission torque strut. Transmissions also receive a number of continuous improvements. The SOHC first gear ratios (manual 3.250:1 / automatic 2.526:1) are now common with the DOHC version. This improves the SOHC vehicle's launch "feel" and performance. In addition, the final drive of the SOHC and the fourth gear of the DOHC automatic transmissions have geometry refinements to improve gear noise. Both automatics also have a re calibrated "performance" mode which provides softer shifts at low-throttle positions while maintaining a firm feel at higher power shifts. This is accomplished by the power train control module (PCM) which shifts pressure scheduling from "normal" to "performance" mode automatically as a function of throttle position. A new, common 1.5 kilowatt "high power density" starter is smaller and lighter, and provides faster cranking speeds then the two lower-output units it replaces. Engine spark timing resolution is improved by sensing changing crankshaft speeds six times per power train revolution (compared to twice per revolution of the previous design). This increase in frequency provides more accurate timing when engine speed is changing, resulting in improved low RPM responsiveness. Saturn's 1.6-liter single-overhead-cam (SOHC) engine has been certified as a common engine for all 50 states, meeting the stringent 0.25 HC (hydrocarbon) and 0.4 NOx (nitrates of oxygen) Federal and California Tier 1 emission requirements. There will be specific Federal and California double-overhead-cam (DOHC) applications in 1994. DOHC-equipped vehicles for the California market will use a "linear" exhaust gas recirculation (EGR) system to comply with that state's Tier 1 requirements. based on inputs from various sensors, the power train control module (PCM) send Electra commands to the OR valve, resulting in continuously variable, yet precise, control of EGR flow. A valve sensor provides feedback to the PAM to assure accurate positioning. An under hood feature quickly noticed is the new valve cover for the SOHC engine. Made of a composite material, this molded black unit replaces the previous cast aluminum outfits of this cover include reductions in noise, cost and mass, as well as providing corrosion resistance, simplified assembly and mesh appearance. Anti-lock brakes (ABS) continue to be a popular option across the Saturn line. Continuous improvement efforts have enabled system engineers to shorten the initialization period and delay it from 3 MPH to 8 MPH. This modification reduces noise entering the passenger compartment and improves pedal "feel." Drivers of SIS and SW2 models will experience improved steering response in 1994 with the adoption of the 16.3:1 gear ratio previously available only for the SC1 and SC2 coupes. The SL, SL1, and SW1 continue to use the 18.3:1 ratio designed calibration requirements have also been added to the available cruise control system to improve response from various driver inputs, adding further to an enjoyable ownership experience. Numerous value features have contributed to Saturn's overall character and its high level of acceptance in the small car marketplace. Customers find that, in many respects, Saturn's philosophy appears to be under-promising but over-delivering especially when taking quality, reliability, performance and safety into consideration. Again, Saturn's commitment to "balanced excellence" results Ill a high price/value relationship. Saturn's space frame consists of approximately 270 individual steel stampings welded together into a single unit. In fact, this computer-designed skeleton does not depend on any of the vehicle's exterior panels for stiffness, strength or crash worthiness. All Saturn vertical exterior panels prone to damage fenders, doors, quarter panels, fascias are made of rustproof, dent and dirt-resistant polymer material. The exterior roof and tailgate of the wagons are formed of sheet molded compound (SMC). A universal primer-surfacer is used to treat the steel and polymer panels before the base-coat color is applied. The high-solids, water borne colors then receive a clear-coat finish for protection from stone-chipping, chemical reaction and environmentally-caused fade. Saturn's precise handling and smooth ride are the result of four-wheel independent suspension improvements. A MacPherson strut system is used up front. Roll control and fore/aft movement are maintained by a standard front stabilizer bar; SL2, SW2 and SC2 models use an increased diameter bar for additional roll stiffness. Rear suspension is a tri-link design. Two parallel unequal length links maintain desired lateral movement, with a single longitudinal link providing fore/aft control. SL2, SW2 and SC2 models are equipped with a standard stabilizer bar for added roll control. Power-assisted front disc and rear drum brakes are a standard feature of every Saturn. For additional control, a four-wheel anti-lock brake system (ABS) is available on all Saturn models. This system includes discs at both front and rear. Light weight, reliable single microprocessor control and on-board diagnostic capability are but a few of this systems features. Traction control first available on Saturn's in 1993 - continues as standard for all automatic transmission-equipped models ordered with ABS. Automatically activated when the car is started, this full-time system optimizes available front-wheel-drive traction to provide a good balance of forward acceleration and lateral stability when the vehicle is driven under slippery conditions. In conditions when front wheel speed is greater than that of the rear wheels (such as acceleration on icy pavements), the amount of power required to maintain traction is adjusted through computer management of the engine's spark timing, transmission gear selection and fuel! delivery control. The driver is advised when a wheel-slip condition exists by a flashing traction active telltale on the instrument panel. 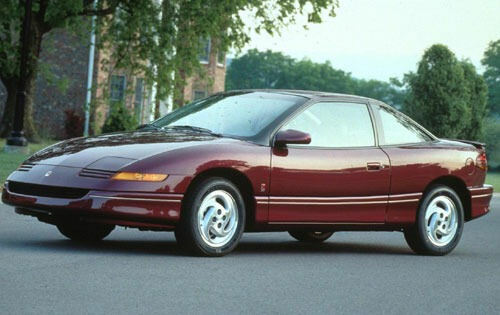 Spirited performance and fuel efficiency, a blend that the engineers have carefully developed for each 1994 Saturn through specifically matched power module (engine, transmission and integrated computer controls) applications. The SL/SL1 sedans, SW1 wagon and SC1 coupe have a 1.9-liter single-overhead-cam (SOHC) engine equipped with a single-point, electronic throttle body injection (TBI) fuel delivery system. Its 85 horsepower is developed at 50000 RPM, with an impressive torque rating of 107 lb.-ft. be 2,400 RPM. Both the five-speed manual and the four-speed automatic transmissions have wide-ratio gearing. The automatic features a dual mode, allowing the driver to select between "performance or "normal" calibrations. While sharing the same displacement, the 1.9-liter four-cylinder of the SLs, SWs and SC2 is fitted with a dual-overhead-cam (DOHC) cylinder head and multi-port electronic fuel injection This variant produces 1994 horsepower at 5,600 RPM and a broad torque range (122 lb.-ft. at 4,800 RPM; 118 lb.-ft. at 2,400 RPM), enhancing overall vehicle performance. Specific manual and automatic transmissions with close-ratio gearing complement the engine performance. Saturn produces its own aluminum engine blocks and cylinder heads, as well as nodular iron crankshafts and differential barriers, using the lost-foam casting process.